Thomas Robert Macquoid was an occasional designer of book covers on cloth and card. Several are identified by his monogram, ‘TRM’, and others were produced to bind publications where he is the sole illustrator; but it is probably the case that others remain to be found. There is scant documentary evidence as to the scope of this work and scholarship is limited, with only a passing comment in Douglas Ball’s account of Victorian covers and an ‘tenuous’ attribution (Ball, 89) in Ruari McLean’s Victorian Publishers' Book Bindings(145). King does not mention him. Little known, Macquoid’s casings are pleasing examples, sometimes lightened by humour and a child-like lyricism, of the decorative style associated with gift books of the 1850s and 60s. His bindings recreate the nature imagery that features throughout his illustrations. 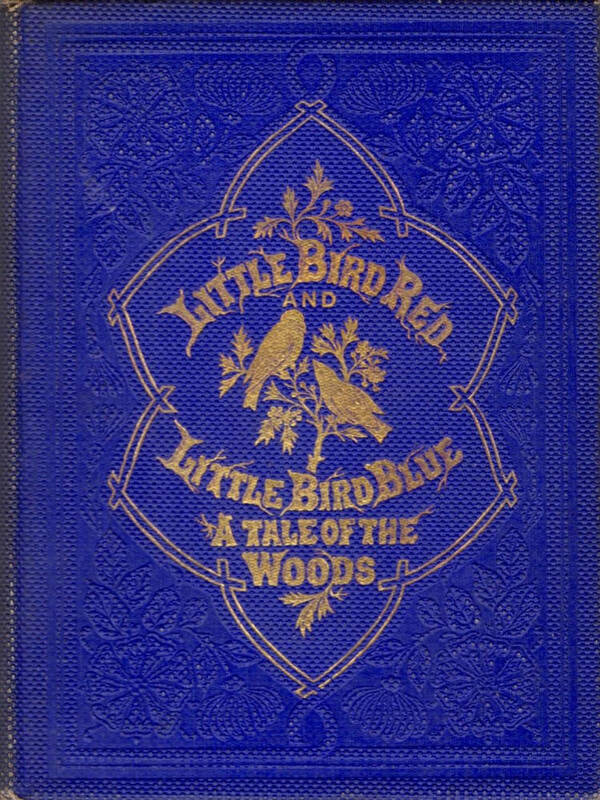 Some repeat the designs contained in the pages bound by the casing: for example, the front cover of Little Bird Red and Little Bird Blue (1861) is figured as a frame containing two birds in gilt, a repeat of the birds appearing on the coloured title-page. As so happens in mid-Victorian book-art, an internal image is projected to the potential buyer by placing it on the front cover. Macquoid’s direct involvement in this work is nevertheless problematic: the figures would be imprinted using a brass die which could have been made by a technician rather than the artist, and there is no way of knowing if he designed the lettering. The question of authorship is posed by all such covers, and Macquoid’s control over the final product is unsure. In a later version of the same book (1883) the relationship between the outer and inner surfaces is unambiguously proclaimed by reprinting one of the colour illustrations on the card cover. This practice is also used on several of Macquoid’s covers for his wife’s travel books, which reproduce his drawings in gilt on the front board. Macquoid’s abilities as a cover-designer are more clearly demonstrated in three flamboyant compositions on cloth: the Illustrated Byron (probably 1858–60), a design for Robert Bloomfield’s The Farmer’s Boy (1857) and Sabbath Bells Chimed by the Poets (new ed. 1861), which had earlier appeared with a gilt motif by W. H. Rogers (1856) and in an unsigned version by John Leighton (1856). Signed with the ‘TRM’ monogram, each of these is composed of floral and rustic motifs arranged into a vibrant pattern. 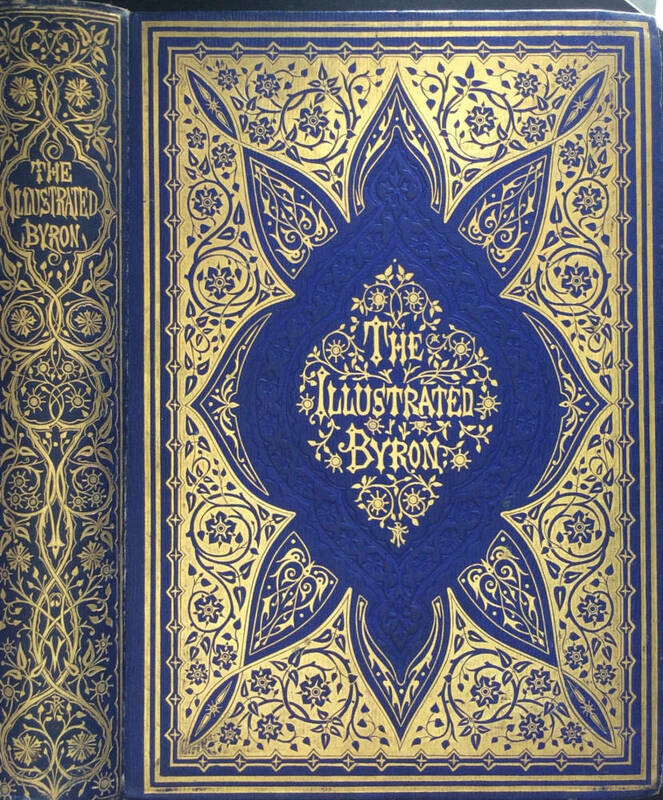 The Illustrated Byron is a heavily-blocked design with the title surrounded by a stylized foliate interlace, a visual showing of the poet’s lyricism which symbolizes plenitude and Romantic nature. 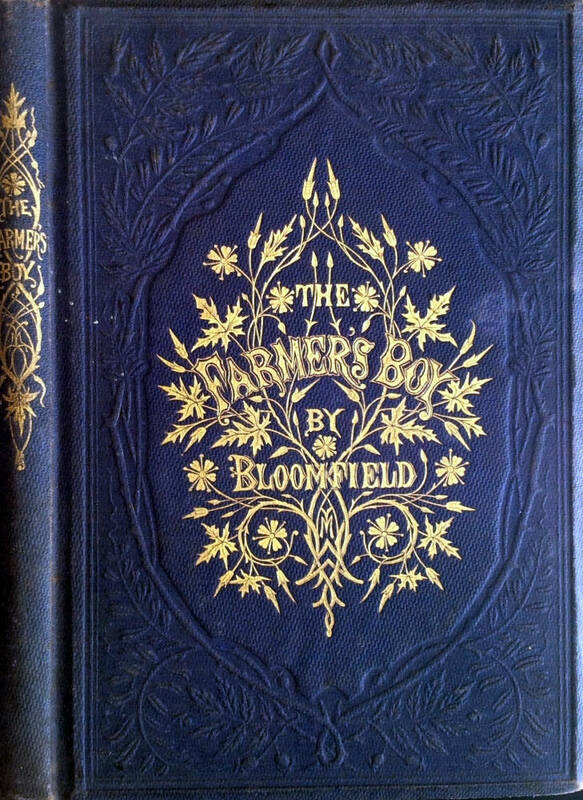 The Farmer’s Boy is likewise figured as a bold interlace of vines and leaves in anticipation of the book’s rural themes, and the same approach, with greater economy, is presented on the front cover of Sabbath Bells. All of the books have embossed covers impressed in blind with floral patterns, and these were almost certainly designed by Macquoid. Two other books embody the same type of nature imagery. An intricate wooden interlace, populated by spreading flowers, insects, birds, and a nest full of chicks, is used to border the title in any early work illustrated by John Absolon, The Child’s Own Alphabet (circa 1852). Published by Joseph Cundall as one of his ‘indestructible’ books for children, this is a delicate design printed from the block on pink cloth (MacLean, Cundall, 74–5). A similar design, depicting a pergola of flowers and leaves and its avian occupants also features on the front cover of The Illustrated London News Almanack (1859). Printed in colours from the wood by the Leighton Brothers (Maclean, Victorian Book Design, 191), this is another example of the artist’s resplendent pantheism. Nature imagery is the unifying theme running through these cover designs and indeed through all of Macquoid’s work for the printed page. A sensitive interpreter of topographical scenes, Macquoid focuses on rustic motifs which combine stylistic appropriation – from German illustration of the forties – with real-life observation. His cover designs exemplify these two tendencies and link his bindings to the work of his contemporaries, William Harry Rogers and Albert Warren. Maqcuoid’s interest in tendrils makes an interesting comparison with designs by Rogers, especially in his covers for Milton’s L’Allego (1859) and The Soldier’s Dream (1856), both of which include the sort of compressed, naturalistic arabesques that feature in Macquoid’s Illustrated Byron. On the other hand, Macquoid’s liking for floral decoration runs in parallel with Warren’s leaves and rosettes on the front cover of Summer Time in the Country (1858) and Wordsworth’s Poems (1859). Each of these is a match with Macquoid’s binding for The Farmer’s Boy and the front cover for the Illustrated London News Almanack. All three designers are bound by the discourse of naturalistic design that dominated the middle of the century. What differentiates Macquoid’s treatment from the others is his interest in fauna as well as flora, especially the birds – which are identifiable by species rather than decorative types – that feature in several of his designs. In part decorative and in part illustrative, his covers mediate between the expressive and the ornamental. The Art and Industry of All Nations. Ed. Charles Knight. 2 Vols. London: J.G. Button [1858–60]. [Spines by Macquoid, front covers by another, unidentified artist]. Bloomfield, Robert. The Farmer's Boy. London: Sampson Low, Son & Co., 1857. Byron, George Gordon. The Illustrated Byron. London: Vizetelly [1858–60]. The Child's Own Alphabet. London: Cundall . Edwards, M. Betham. Little Bird Red and Little Bird Blue. London: Sampson Low, Son & Co., 1861; American edition, New York: James G. Gregory ; later edition, with a cover reprinted from one of the pages, London: Routledge, 1883. Edwards, M. Betham. Snow Flakes and the Stories They Told the Children. London: Sampson Low, Son & Co. . The Illustrated London News Almanack, 1859. 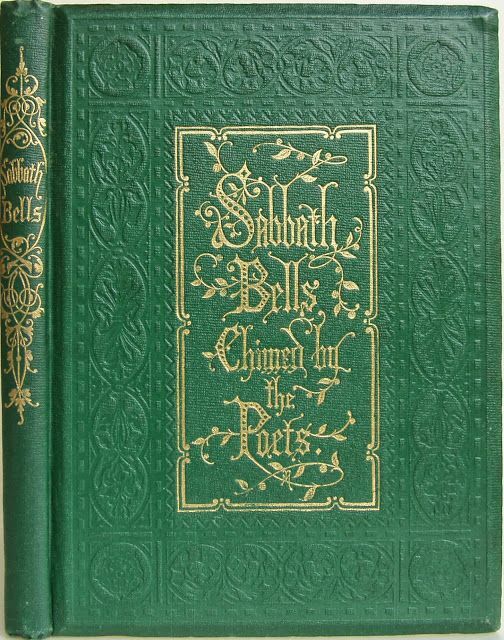 Sabbath Bells Chimed by the Poets. London: Cundall, 1861. Ball, Douglas. Victorian Publishers’ Bindings . London: The Library Association, 1985. Graves, Algernon. A Dictionary of Artists, 1760–1893. Bath: Kingsmead Reprints, 1970. Hardy, Thomas. Collected Letters. Vol. 1. Ed. Michael Milgate. London: Clarendon Press, 1978. Mclean, Ruari. Joseph Cundall. Pinner: PLA, 1976. McLean, Ruari. Victorian Book Design and Colour Printing. London: Faber & Faber, 1963. McLean, Ruari. Victorian Publishers' Book Binding in Cloth and Leather. London: Gordon Fraser, 1974.